Is It Better for a Company to Hire Accountants or Use An Agency that which provides Accounting Services? The growing scale of business operations brings an obligation to keep up all legalities associated. Especially for bookkeeping where the number of transactions becomes huge & complex, finding an appropriate accounting professional becomes a tedious process. There are several options available to an entrepreneur to suffice the accounting needs of his business, not only limited to hiring a professional accountant he can also put an accounting service provider agency to a legal contract. But to compare, only a preferred choice between an accountant or an accounting service provider agency is needful. Hiring an accountant or an accounting service provider agency all depends on the functionalities and diversities of business operations. These days, entrepreneurs not only look for the basic non-core activities of accounting for their businesses but also expects them to have better control over their cash flows, fund leverages, tax planning objectives, and other related compliances. An accountant placed in a separate department or an outsourced contract to an accounting service provider agency each carries certain advantages and disadvantages to analyze. Professional and experienced accountants are well specialized in all clerical jobs such as managing payroll, payables, receivables, bookkeeping, payroll processing and furnishing tax returns. Small businesses are always in a need of smart accounting professionals who can be trusted to hold all complex financial tasks on their own and can manage all reporting procedures without requiring major interactions or involvement of company owners on regular basis. If hired for specific jobs, an accounting professional can be given a wide range of duties to manage a particular niche in the organization. Placed in a department he can be opted for internal accounting requirements and reviewing of job work. A distinct approach which qualifies to hire an accountant is his personalized advisory which comes as an addition to the hiring package. To build bottom line profitability, small business owners can coordinate with them to plan financial strategies and develop long term goals. For small businesses, seamless navigation of tax files and returns incurs them – an unconditional recurring cost of accountant salary, perks, and bonuses for which they are only benefitted with personalized assistance when needed. No accountant ever guarantees efficiency or he might not be accurate in procedures at one or the other point. A non-efficient one if hired can gradually make the overall reporting of business disastrous and can add further higher tax liability. Specialized in their work culture, governed by numerous experienced professional accountants – hiring an accounting service provider agency is another personalized option for both large and small scale entrepreneurs for their accounting needs. Like choosing a human resource, an entrepreneur also gets an option to hire the most efficient and cost-effective agency to serve for any of his particular accounting concern. These agencies as occupied and managed by professionals provides unending services under single roof may it be – payroll, bookkeeping, tax computations, licenses, registrations, statutory return filings etc. On an advantage, these agencies reduce the compliance cost of business in terms of payment of only service fee for getting outsourced for particular job work. Also, an entrepreneur finds it more comforting to trust an agency managed by industry professionals and to hire an expert from the agency within a limited prescribed fee for some specified range of financial issues. To work with an agency providing accounting service is limited to the extent of their price packages opted. Also, there is a lack of personal touch with the professionals for ongoing assistance required for other advisory matters including preparation of financial statements and reporting. Also Read: How Outsourcing of Bookkeeping And Accounting Service Works? There is much correlation between hiring an individual accountant or an accounting service provider agency. Generally, accountants and professionals who have excelled in different job positions and had gained long-time experience working with numerous corporate agencies compose such agency networks and can be opted without any further doubt of inefficiency. Now you have a clear thought of the difference between both. 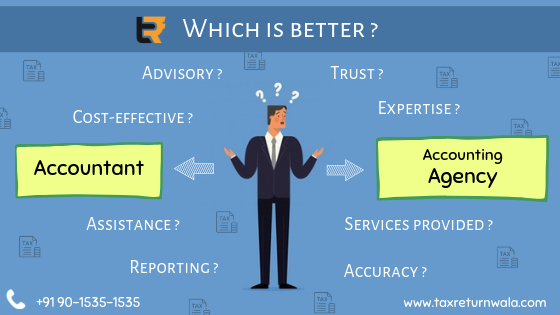 So what’s your take in this – Accountant or Accounting service provider Agency?